This led to a site-specific theatre piece on Morecambe seafront. Featuring a Mobility Buggy Ballet, a Ghetto Blaster Symphony and a series of intimate performances, the work culminated in massive film projections on the facade of the Midland Hotel (now re-opened after restoration by Urban Splash). The show explored the special relationships that skip a generation, uncovering a wealth of experiences, and an openness and honesty that was funny and moving. Relative formed the research stage of a new professional multimedia show from Niki and Kathy, exploring the themes of working with the participants in Morecambe. 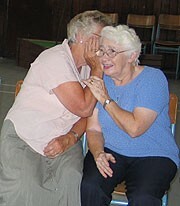 The show toured extensivley in 2006, including a series of workshops with grandparents and grandchildren across the UK.